Your out the door no haggle price is $52,950 + 7%(if you are an Indiana resident) = $56,656.50... (We do not charge you any kind of doc, title fee).......... 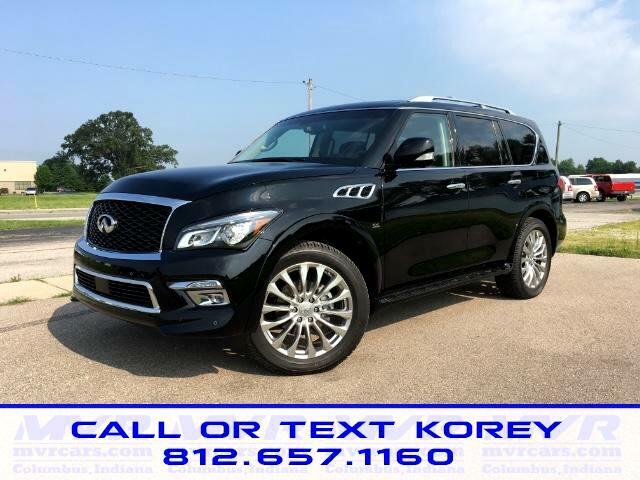 Zero accidents and only one previous owner on this 2015 Infiniti QX80 AWD with plenty of options! Remaining factory warranty!! 19k miles, 5.6L V8 Automatic, Black Obsidian exterior, Black leather interior(non-smoker), equipped with the Infiniti Around View Monitor system along side the back-up camera and sensors, power windows, locks, and mirrors, in-dash touch screen with NAV, RADIO-CD-XM-USB-AUX-Bluetooth, Bose Premium sound system, power sunroof, DVD dual 7in monitors in headrests(pair of headphones and remote still in plastic), power front seats, cruise control, heated front and middle row seats, heated steering wheel, dual and rear climate control, power opening and closing rear lift gate, power up and down rear seats, power folding middle row seats, factory cloth and all-weather floor mats, 22in wheels(factory upgrade), Bridgestone tires in great shape, running boards, tow package. Beautiful car, priced well below others! Please don't hesitate to ask any questions! Bank financing available if needed, Please call/text Korey at 812.657.1160 Thank you for looking!